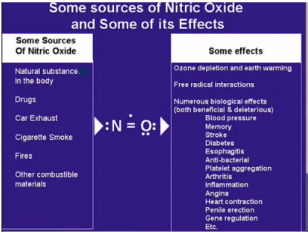 Nitric oxide research has grown rapidly with about 150,000 research publications describing its biological effects. It is an important messenger molecule that affects most tissues and biological processes. Many effects of nitric oxide are mediated by the increased production of cyclic GMP with its activation of guanylyl cyclase. Nitric oxide can function as an intracellular messenger, an autacoid, a paracrine substance, a neurotransmitter or as a hormone. It is a unique molecule with an array of signaling functions. While it is produced from the amino acid L-arginine by nitric oxide synthases, it can also be produced from some prodrugs or precursors such as nitroglycerin. Various medical disorders are due to too little or too much of these messengers. As a result, many pharmaceutical and biotechnology projects have been aimed at developing novel therapeutic products.